A child’s confidence is their biggest weapon in this world and no one has more power to shape this tool than their mother. Starting as babies, we help shape our children’s confidence and give them the tools they need to strengthen and use it. Let’s face it. We are raising our children in a very harsh world and we can’t afford to not raise them to be confident and have a voice. So often we hear stories about children being abused and when they tell someone, no one believes them. What do you think this does to them? It teaches them that they have no voice that they don’t matter and it destroys any confidence that they have so they continue to allow the abuse because they think no one believes in them. We see people who have given up on their dreams because they didn’t believe in themselves enough. Someone with no confidence is heartbreaking to me and that is why raising my kids to be confident is so important to me. I want them to grow up knowing that they are important, that they matter and that they can do absolutely anything they can dream of. As far as I’m concerned, they have no limits. I am continuously thinking of ways to help improve my children’s confidence. Below are a few of the ways I do so on a daily basis. These tips will instill a sense of importance in your children and remind them that they have the ability to make a difference. “I can’t” to “I can”. Turn your child’s negative statements into positive ones. Not long ago, I was helping my son with his math homework. He was stuck on a particular problem and he got upset because he couldn’t figure it out. I asked what was wrong and he replied, “Mom, I just can’t do it”. Hearing himself say that brought tears to his eyes. I took him to another room and sat down so I was eye to eye with him. I made him say “I can do this” over and over until he started to smile. Then I asked if he was starting to believe that he can do it and he said yes! Our words have so much impact on our feelings and they can cause harm to our confidence if we let them. So teach your child that whenever they have the urge to say something negative about themselves to replace it with the opposite, a positive statement. Tell them to say it over and over either out loud or silently until they start to feel better. We went back to his homework and he finished it by himself! And I saw his pride soar after that incident. Listen to them. This one is particularly hard for single moms because we are incredibly busy! And because children talk A LOT! Did you know the average child asks over 300 questions a day? No wonder moms “know everything”! As busy as we are, it is so easy to brush our child off for the sake of getting things done. But no one wants to be heard more than a child and no one is easier to brush off than a child. Because our children don’t quite understand our busy lifestyle when we act too busy to listen to them, they take it to mean that what they have to say is not important and this can be very hurtful for a child. I’m not saying you have to always drop everything you’re doing whenever your child comes to you with the next earth shattering story. If I have an important task I’m about to embark on (such as school work), I let my kids know ahead of time that mommy is going to be doing something very important for a while and that they need to give mommy some time. Surprisingly, this works! Other times, I stop what I’m doing and I give them the next few minutes of my undivided attention. Sure, they usually want to talk while I’m in the middle of vacuuming or replying to a reader’s email but if being heard is important to them, it’s important to me. Our children see us as the most important person in their life and to them, if we think what they have to say is important then they will feel as though what they have to say is important. Believe them. Children tell some crazy stories! But there’s truth to most of them. It’s so important to believe what our children say because if we don’t believe them, who will? My children got off the bus one afternoon really worked up about something. I asked what they were so chatty about and they told me they had to tell me something. They told me that their friend they ride the bus with told them that every day when he gets off the bus, some men in a white van chase him with a sharp stick. They said they had even seen the van that afternoon when their friend pointed it out. Crazy story right? The options went through my head. Should I call the police? Should I call the school? Should I sum it up as a child’s over reactive imagination? My daughter asked if I believed them and I took her hand and said “Absolutely”! Next thing I knew, I was on the phone with the school’s principal telling her exactly what my children told me. The principal reassured me that they would investigate. I told my kids that they did the right thing by telling me and I thanked them for speaking up for someone else. I also reminded them that it is important to always speak up even if they are afraid no one will believe them. My son thanked me for believing him. I could feel it in their hugs after, how much my believing in them had empowered them. They saw how their voice can make a difference. Even if you have doubts, always believe your children enough to act on what they say. Ask Them What Makes Them Feel Special. When someone goes out of their way to do something they know will bring a smile to your face, it makes you feel that much more special, doesn’t it? You are so important to your child and they look up to you. So when you go out of your way to do something you know they like, it makes them feel so important! I ask my children every now and then what I do that makes them feel good inside. 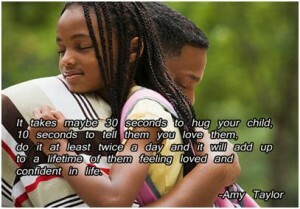 For example, the last time I asked, my son said he likes my hugs and my daughter said when I make her cookies. So for the next week I made it a point to hug my son every time I saw him and I made my daughter her favorite cookies. What I got in return was a lot of pride filled smiles. They were thrilled by my extra attention. So ask your children to name one thing that you do that makes them feel special and do that one thing for a week or even just a day. It’s so rewarding to see how your attention makes them feel special. Chores Are a Win Win Situation. You might meet some resistance with this one but what children don’t know that we do is that having responsibility makes us feel important. We gain a sense that we are needed when we see how our work impacts others. So what I do is I take the easiest of tasks from my daily list of “things to do” and I divvy them out to my two little ones. These things can range from feeding the cats to putting their laundry away to watering the tomato plant out back. But don’t just give them a few things to do, make it fun! I have a designated “chore time” and I turn on my Pandora on the kids party channel and I make them dance while they do their chores. I even dance while I do some of mine! Or I have them color code their laundry before putting it away. Be creative and give their chores that little bit of spice to liven them up. Not only will it make it fun for them but you’ll meet less resistance. I also make sure to thank my children whenever they help me. It’s important for them to feel your appreciation. This doesn’t take much, just a simple thank you. This shows them that their work is important. Your child’s confidence is the one powerful tool that they will be able to use in any situation for the rest of their life. It’s up to us as mothers to guide them in strengthening this tool. Show your child that they matter in this world by giving them an indestructible base…confidence. It all starts with showing them that they matter in your eyes mom.